A second half goal by Rancho Cucamonga’s Lauren Perry proved to be the difference in the Cougars’ Baseline League home victory over Los Osos, 2-1, on Jan. 20. Claremont 3, Cathedral City 0 >> Karsyn Jordan had a goal and an assist, Oksana Sosnovsky and Claire Colinco also scored in a San Gorgonio Tournament game. Alexis Garvin made two saves and Ronnie Romero made one for Claremont. Claremont 2, Oak Hills 0 >> Karsyn Jordan had a goal and an assist, Danielle Lagrave scored and Sydney Fortson made two saves to lead the Wolfpack (11-2-2) into the championship game for the San Gorgonio Tournament. Oak Hills 2, Redlands East Valley 1 >> Danika Bowman scored the only goal for the Wildcats in the San Gorgonio Tournament loss to the Bulldogs. Both teams will continue play in the tournament tomorrow. Redlands East Valley 2, Cathedral City 0 >> Sierra Felt-Morales scored both goals for the Wildcats in the San Gorgonio Tournament victory over the Lions. San Gorgonio 2, Jurupa Valley 1 >> Leslie Spratley scored two goals for the Spartans in the San Gorgonio Tournament victory over the Jaguars. Jacqueline Garcia and Phoebe Amaro were credited with assists while goalkeeper Cristen Pedroza had three saves for the Spartans. San Gorgonio 1 (6), Redlands 1 (5) >> Phoebe Amaro scored the lone goal during regulation for the Spartans off an assist from Adamari Torres in the San Gorgonio Tournament victory over the Terriers. Goalkeeper Cristen Pedroza had 10 saves against the Terriers. San G will play at 1 p.m. today against Apple Valley in the consolation bracket championship game. Alta Loma 8, Pacific 0 >> Brooke Kortekaas and Moriah Collins each scored three goals for the Braves in the San Gorgonio Tournament shutout win over the Pirates. Ashlyn Farino and Allison Brossard also added goals for the Braves.Both teams will return to tournament play on Monday. Alta Loma 2, San Gorgonio 1 >> Allison Brossard and Kastel Heinold each scored a goal for the Braves in the victory over the Spartans. Jacqueline Garcia scored the lone goal for the Spartans in the San Gorgonio Tournament loss. Goalkeeper Cristen Pedroza had eight saves for the Spartans. Both teams will return to tournament play on Monday. Claremont 5, Apple Valley 0 >> The Wolfpack (9-2-2) had five different players score a goal in the San Gorgonio Tournament victory over the Sun Devils in pool play. 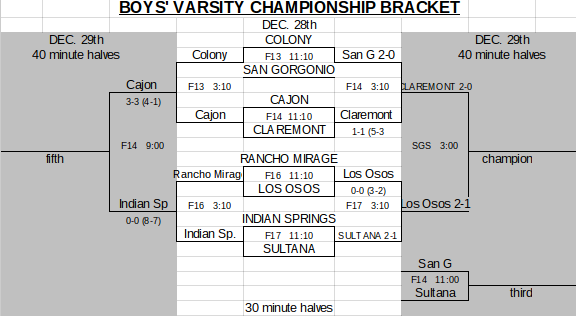 Claremont will play on Monday against an opponent yet to be determined in the San Gorgonio Tournament. Claremont 1, Rim of the World 0 >> Claire Colinco scored for the Wolfpack in the San Gorgonio Tournament victory over the Scots. 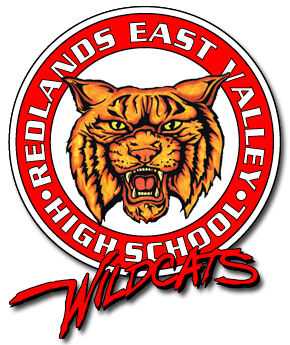 Redlands East Valley 3, Beaumont 1 >> Karley Weeks had three goals for the Wildcats in the San Gorgonio Tournament victory against the Cougars. Goalkeeper Marina Medeiros had four saves for the Wildcats. Redlands East Valley 3, Patriot 0 >> Karley Weeks scored two goals for the Wildcats (3-3-2) while Kessy Uribes added one in the San Gorgonio Tournament victory over the Warriors. Goalkeeper Marina Medeiros had four saves against the Warriors in the shutout. REV will play at 11:10 a.m. Monday against Oak Hills. San Gorgonio 4, Pacific 0 >> Leslie Spratley scored three goals for the Spartans in the San Gorgonio Tournament victory over the Pirates. Phoebe Amaro scored a goal while goalkeeper Cristen Pedroza had four saves. The Pirates had seven saves in the game. Both teams return to tournament play on Monday. Summit soccer: a new homefield advantage? Remember when it used to be a big deal to play soccer on a field turf field? Well, when I was covering Summit-Ontario girls soccer on Wednesday, Summit coach Steve Jennings pointed out that in some places, momentum has swung the other way. While Summit played several preseason games at Ralph Lewis Park (with field turf) all of its Sunkist League home games will be at the high school, on grass. This is due in part to the fact that Ralph Lewis Park is having work done, but last year, Summit also moved its league home games to campus. So, in the six-team Sunkist League, only two schools play home soccer games on grass: Summit and Fontana. So, perhaps, Jennings reasoned, Summit might have an advantage playing at home because most other teams in the league won’t be as used to playing on grass.